I get so freaking angry when I see stories such as this one in The Age. 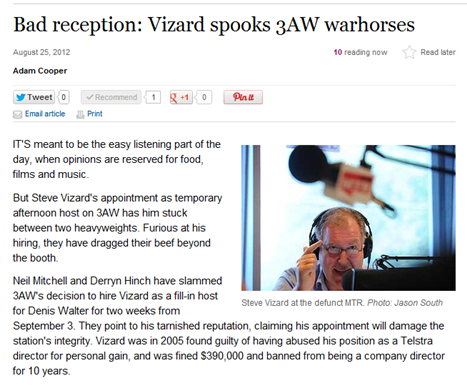 (http://www.theage.com.au/entertainment/tv-and-radio/bad-reception-vizard-spooks-3aw-warhorses-20120824-24s3v.html). Apparently Neil Mitchell and Derryn Hinch are concerned that having Steve Vizard as a fill in announcer on 3AW is inappropriate, as he is "still in disgrace" and will damage the station’s reputation. How do these hypocritical shock jock tossers seriously think they have the credibility to make such comments? Particularly Hinch. Give me a break. Have you looked in the mirror lately, idiot? Does anyone need to remind you that you have had custodial sentences imposed on you for breaking the law. It doesn’t really matter whether you agree with it or not. YOU BROKE THE LAW!!! Stop trying to turn being thrown into jail as a positive. And voting IS compulsory. If you want to have some credibility, show a good example to others. And as far as Mitchell is concerned – “he’s not a fit and proper person to have the privilege of using a 3AW microphone or the airwaves.” Privilege? Oh spare me. Since when did you become God? It’s a job, dickhead. You’re a crappy muck raking journalist and shock jock radio announcer. Nothing more. Nothing less. You don’t make life and death decisions. You’re supposed to inform people about others that DO make life and death decisions. On the scale of what’s important and what’s not, your job is not that important. GET A LIFE! And by the way, don’t take any of this as me being a Vizard supporter. Couldn’t be further from the truth. I just can’t stand journalists and people who, through their ability to more easily reach the community, seem to think they are significantly better and more important than the rest of us.